This section summarizes the recommendations regarding pedestrian characteristics as reported in the companion volume, Literature Synthesis for Chapter 13, Pedestrians, of the Highway Capacity Manual (Rouphail et al., 1998). Recommendation. This study recommends for design a simplified body ellipse of 50 cm x 60 cm for standing areas, with a total area of 0.3 m2, or roughly 108 percent of the ellipse suggested by Fruin (1971). This shape (Figure 2) serves as an approximate metric equivalent to Fruin's ellipse. This study also recommends a body buffer zone of 0.75 m2 for walking, near the upper end of the buffer zone range provided by Pushkarev and Zupan (1975a) and just before "unnatural shuffling" commences. Recommendation. This study recommends a pedestrian crosswalk walking speed value of 1.2 m/s (3.9 ft/s) for most conditions, consistent with recommendations described in the Literature Review for Chapter 13, Pedestrians, of the Highway Capacity Manual from several sources. In areas with large numbers of older pedestrians, this study recommends a crosswalk walking speed value of 1.0 m/s, a nearly 30 percent decrease from current HCM values. The question may arise, "What constitutes large numbers of older pedestrians?" A suggested answer is, "large numbers of older pedestrians exist when the elderly proportion begins to materially affect the overall speed distribution at the facility." Through a simple analysis of a simulated dataset, it was found that the 15th percentile speed for the overall population will drop to 1.15 m/s (i.e., at least 0.05 m/s below the recommended default value of 1.2 m/s) when the elderly proportion increases to about 20 percent. Therefore, this study recommends the use of the lower 1.0 m/s value when the percentage of elderly using the facility in question exceeds 20 percent. Table 1 summarizes the recommendations. For demographics information, consider census data at the neighborhood level. Figures 3 and 4 illustrate some typical users who may benefit from the proposed changes. TABLE 1 Recommended pedestrian crosswalk walking speeds. FIGURE 3: This elderly pedestrian, and others like her, may be helped by the proposed revisions to crosswalk walking speeds. 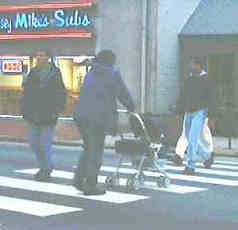 FIGURE 4: The proposed revisions to crosswalk walking speeds may also benfit people who are not elderly, such as this pedestrian pushing a stroller. Recommendation. This study recommends that the HCM include a policy of not correcting for grades less than 10 percent. Above 10 percent on upgrades, this study advocates a 0.1 m/s reduction in walking speed as an approximation (roughly the amount found by the Institute of Transportation Engineers in 1976). Recommendation. For most situations where platoons are prevalent, this study does not recommend the use of walking speeds lower than 1.2 m/s (1.0 m/s for large elderly populations). However, in light of the research by Virkler (1997c) described in the Literature Review for Chapter 13, Pedestrians, of the Highway Capacity Manual, this study recommends increasing the minimum signalized intersection crossing time when typical platoons exceed 15 people. This report details several crossing time computational methods later. This study also cautions the analyst to consider impairments to full usage of the crosswalk. These may include: lack of a stop bar, lack of high-visibility crosswalk markings, crosswalks misaligned with the natural flow of the sidewalk, and corner obstructions. Recommendation. For simplicity, this study recommends retaining the HCM's value of 3 s, a reasonable mid-range value between the 50th and 85th percentile design values (2.5 and 3.75 s, respectively) for older pedestrians suggested by Knoblauch, Pietrucha, and Nitzburg (1996) and described in the companion Literature Review for Chapter 13, Pedestrians, of the Highway Capacity Manual. Recommendation. Given the comfort zone requirements for Americans, it seems that walkway capacity lies between 4,000 and 5,000 pedestrians/h/m. For simplicity, this study recommends an assumed capacity of 75 ped/min/m (4,500 ped/h/m). This study recommends an assumed speed at capacity of 0.75 m/s. In addition, this study recommends the pedestrian buffer zone space of 0.75 m2/ped for a capacity threshold. Recommendation. This study recommends the use of platoon flow Level of Service (LOS) considerations (discussed later) in lieu of a pedestrian "peak-hour-factor" (PHF) or similar measure. Pedestrian queueing is of comparatively short duration relative to the vehicular queues that a PHF typically describes.